Because I just spent the last two days driving over 24 hours from Montana to Minnesota to Wisconsin (stop being jealous, stop it!) and because my sweet little babe and endlessly patient husband had to endure that same driving stint and because I have less than a week before my house is packed up and moved and because I cried like a baby leaving my four rowdy rugrats at Grandma’s for a week (bless you, Grandma!) and because I’m just a regular mess of mascara-smeared anxiety and stress right now (seriously, I better stop now before all of you defriend me immediately), I’m going to simply say that this meal is so fantastically delicious, you need to make it. Slow Cooker + unique and flavorful spices + tender chicken + crunchy fresh veggies = a perfect weeknight meal to kick off the start of the school year (for those that care about school years and fast dinners). 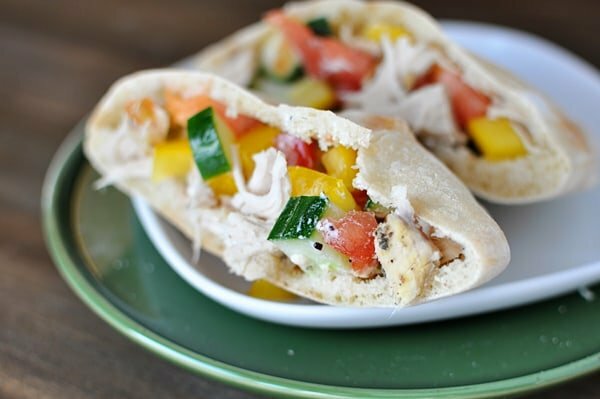 If you feel the need to be a regular Betty Crocker, make your own pita bread, and this meal will go from great to really great. Wow. I’m killing myself with eloquent descriptions tonight. You get what I mean, though, right? Make this. It’s delish. 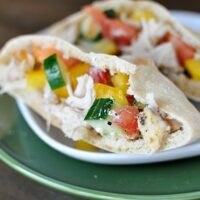 If you don't have pita pockets or say, your homemade pita bread doesn't puff, this chicken filling is equally delicious rolled up in the non-puffed pita pockets or wrapped in something like these soft wrap breads or other flatbread type breads. Sorry this may be a dumb question, but I have never cooked chicken in my crock pot without liquid (like chicken broth). Does this cook for 5-6 hours with no liquid? How does it not dry out/burn? That’s a good question, Karalyn. This has worked fine in my slow cooker but if your slow cooker cooks hot, I’d suggest adding maybe 1/2 cup of broth or so. Hey Mel, what would this be like without the onions? Could I substitute them with anything? I LOVE your recipes by the way and have made dozens…and dozens…and probably even more dozens! Thank you!!! I made this for dinner tonight, and loved it! My kids were not big fans, however. Obviously I need to try new recipes more often. The home made pitas were much yummier than the store bought. Also, being the dork that I am, it took me a couple to realize that I needed to layer the chicken and vegetables like a sandwich, not like a taco. Sure, I think it would still be ok! It’s always a good idea to salt and pepper to taste. Hi! I just found this recipe. Can I subsitute the plain yogurt for greek yogurt? I think so although it might be more watery than if using the thicker Greek yogurt. Mel, I am new to your site and I love it!! Do you cook your chicken for a little while and drain the grease off before adding the seasonings? I get confused when I am supposed to do this or whether its part of the juices. The last recipe that I did, didn’t mention doing this and it ended up being way to greasy. Do you mean in the slow cooker, Lindsay? No, I don’t remove it or any liquid before adding the seasonings although if you are worried about the fat, you could. I usually use very lean boneless, skinless chicken breasts so there isn’t a lot of excess grease. Does the chicken have to be thawed for the times given? How much more time should I let it cook if it’s frozen? Is that even recommended? I’m kinda new at the slow cooker, still trying to figure out adjustments and substitutions. Cat DuFoe – Usually an extra 30 minutes is enough for frozen chicken. I use frozen chicken all the time and it thaws pretty quickly in the slow cooker. I made your homemade flatbread a couple of days ago. The first day we made mini pizzas with it and yesterday we made this and and served it in the flatbread. My small children loved the look of the pizza but turned their noses up at this dish. Then they tasted it and my 8yo boy and 6yo girl started fighting over who would get to make it on their dinner night. We all loved it. It was very quick and easy and so yummy! Thanks! I made this and the homemade pitas. It was light, refreshing, and tummy satisfying. I am definitely going to make this again. Thank you for all that you do! I made this with chicken thighs, and cooked it in the pressure cooker because I forgot to throw it in the crock pot in the morning. It was really tasty. I’m sure it would have been a thousand times better with homemade pitas, but we still enjoyed it. Thanks! Hey Sarah – I’m sorry to hear that! Looks like if people are worried about burned chicken, it would be safer to add 1/4 to 1/2 cup of chicken broth. I haven’t had that problem when I’ve made it but every slow cooker can cook at different temps. hmmm….I made this today, on low, 5 hours and the chicken did burn and was dry dry dry. I wonder what went wrong? I should have read the comments first!!! Mel I hope you have a great move and get settled into your home soon. Thanks for all the great recipes! Stefanie – my chicken didn’t burn at all with no added liquid. I suppose if you have a slow cooker that cooks excessively hot, it might not hurt to add 1/4 cup of liquid but you don’t want it to be overly liquidy. The slow cooker, based on how it cooks, creates moisture and liquid so even without adding any, it still creates delicious juices from the chicken and spices. Very, very good but the recipe calls for too much pepper and not enough yoghurt. Cut the pepper in half, double the yoghurt, maybe add 6 oz of white wine to the sauce before serving, and this could be a 4- or 5-star winner. Just came across your site. This recipe looks simple and satisfying. I love anything slow cooked. I will definitely give this a try, as right now I am cooking a slow cooker lasagna. I will be passing this recipe on to my friends and family as I think this will be great for work and school lunch boxes. Again, thank you. Good luck with the move! I’ve made a similar recipe before but add dried Greek seasoning with the lemon pepper seasoning and never thought to do bell peppers with the cucumber and tomatoes. This looks fantastic. I am making chicken right now and plan to make this for school lunches this week. My littles will love it! Looks so good. Wish I had a slow cooker. Are you going to start a new blog called The Weeping Chef? Good Luck with your move… I love your recipes! Slow cooker meals save the day during stressful times. Moving is tough, but there are good things that await in new places too. Will you be settling in MN or WI? 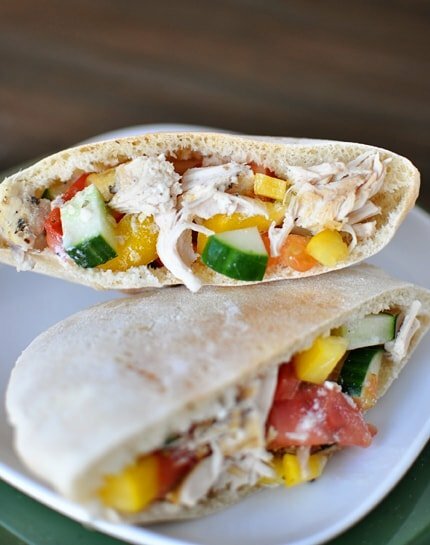 This looks delicious, Mel, and it’s the perfect recipe to stuff your homemade pita bread with! I’m really looking forward to making the pita bread and trying this recipe!